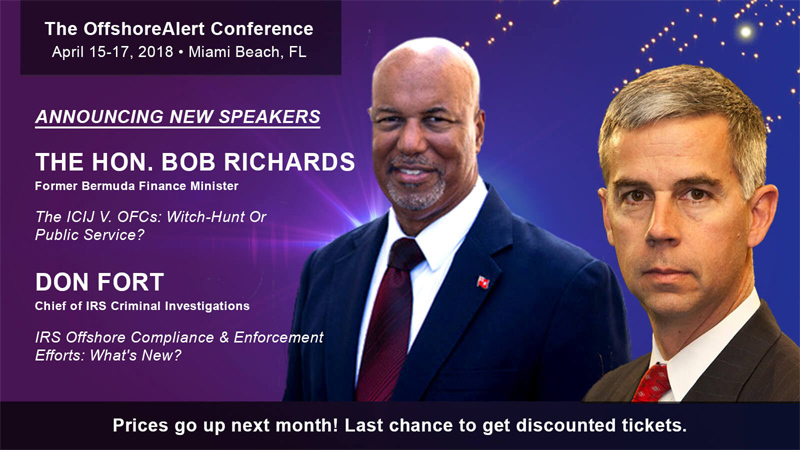 Former Finance Minister Bob Richards will be speaking at the OffshoreAlert Conference in Miami in April, the organisers announced today, with Mr Richards set to join former Premier Michael Dunkley who was already announced as one of the speakers. The event website describes it by saying, “With its Paradise Papers and Panama Papers projects, the International Consortium of Investigative Journalists has become Public Enemy Number One in the offshore world. Can’t think of two better people to go to bat on our behalf. O J 24-12 and you can’t even collect the garbage. The disrespect caused your tragic loss at the Bermuda polls in July 2018. Be nicer to your opponents, especially to your OWN people . Then, GLORY will be yours!!!!!! Relief. Bob Richards will deliver with the experience and expertise we have always relied on. He’s no spin doctor. It would be interesting to know who is paying for this little jaunt. Is it comped by Offshore Alert or are Dunkley and Richards paying their own way? In doing your own OBA political spin, PLEASE don’t shoot Bermuda in the foot and reputation as both Mike Dunkley and “Fussy Numbers” Bob Richards have done in international media or social media in the past! KBB not only for Keep Bermuda Beautiful, but also Keep Bermuda Benefiting!